The logistical challenge of feeding 400+ Cornell University students and staff members Rosh Hashanah dinner in “Trillium at Kennedy Hall” and an overflow in an outside tent–in addition to two daily meals throughout the school year– was one that STAR-K Kashrus Administrator Rabbi Mayer Kurcfeld was up for. Cornell’s 104 West! and It’s Kosher– the campus’ satellite kosher dining station at North Star Dining Room—is presently the sixth college kitchen under this campus kashrus expert’s supervisory guidance. 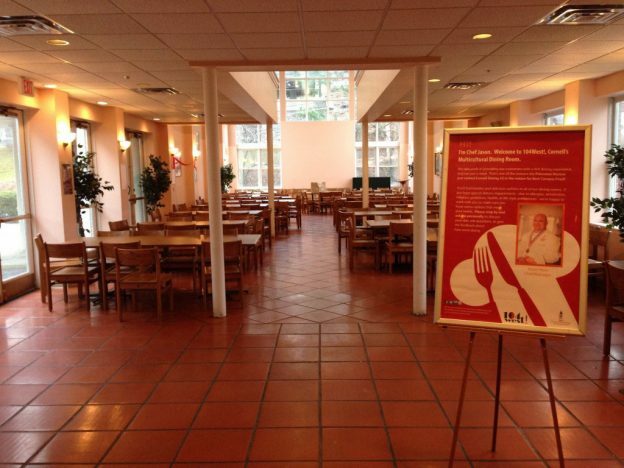 Cornell upperclassman Sam Baer, president of the college’s Center for Jewish Living, first approached STAR-K Kosher Certification in March, 2015, about the possibility of certifying an on-campus kosher kitchen. After making three 12-hour roundtrip drives from Baltimore to the Cornell campus in Ithaca, New York, the STAR-K and STAR-D logos were awarded in time for the Fall Semester. One of the factors unique to certifying a college kitchen versus a restaurant is finding just the right 24/7 mashgiach “shidduch”. In this case, someone who is not only competent but willing to live on campus—since there is no frum kehilla or shul besides the one on campus. Rabbi Kurcfeld opted to hire a qualified couple so a spouse could fill in should the need arise. “Gavriel and I both knew this was where Hashem wanted us; it was pure hasgacha pratis how the Jewish network lead us to STAR-K,” says Mrs. Ress, who together with her husband left close family and friends behind in Miami Beach, after immigrating from Johannesburg, South Africa. “We couldn’t feel more blessed with where we have ended up. Everyone involved with the 104 West! from the staff to the management–especially Paul Muscente, Associate Director of Dining, and Jason Haus, the Head Chef/Manager, and Sam Baer–have showered us with warmth and welcoming so this more than makes up for the frigid drops in temperature we will be experiencing. In addition to the Cornell kitchen, STAR-K certifies Dickinson College in Carlisle, PA; Franklin and Marshall College in Lancaster, PA; Muhlenberg College in Allentown, PA; Towson University in Towson, MD; and University of Maryland Baltimore County (UMBC) in Catonsville, MD. They all offer both Meat and Dairy options; some also offer Shabbos, Yom Tov and/or Pesach programs. In November, the Hillel House kitchen on the Rutgers University campus– a new building with two new kitchens–is scheduled to open. The seventh STAR-K certified college campus kitchen will offer meals seven days a week, says STAR-K Kosher Certification National Kashrus Coordinator Rabbi Shmuel Aron Heinemann of STAR-K’s New York/New Jersey office. “STAR-K is happy to reach out to and take care of the needs of these students, offering attractive, delicious kosher meals without compromising high standards of kashrus in our commitment to uphold our mission,” concludes STAR-K President Avrom Pollak. To discuss the feasibility of providing a kosher option on your campus, contact STAR-K: 410-484 4110.